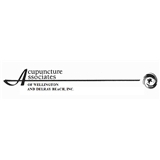 Acupuncture Associates of Delray Beach (Lake Worth) - Book Appointment Online! Professional, Timely, Beautiful office. Dr. Schiff spend a lot of time with me, I felt very well taken care of and I know she knows her stuff.